The QuoteWerks integration to Microsoft Dynamics CRM is only available in the Corporate Edition of QuoteWerks. 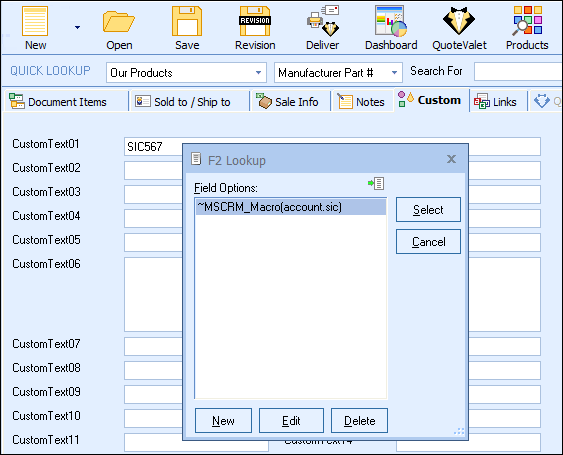 From the Sold To / Ship To tab of the QuoteWerks quote workbook, you can search the MS CRM database for a contact by name or phone number. You can also search for an Account by company name or phone number. QuoteWerks will fill in the contact information in the quote by pulling the contact information from the contact that you searched for. You will never have to re-type your customer information. Additionally, any Contacts associated with an Account can be returned with the search results. When saving a quote, QuoteWerks automatically creates a Note record for the opportunity and will attach a linked document as an attachment in the note. 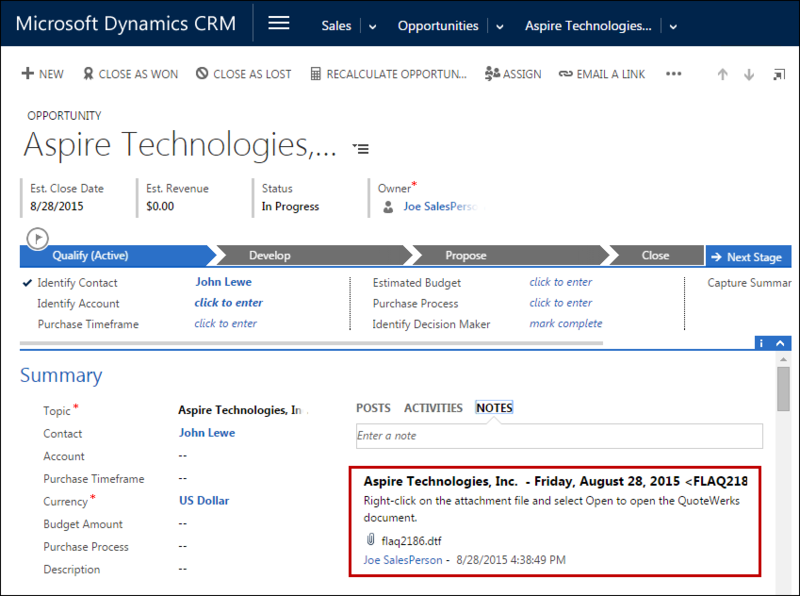 When you are in MS CRM you will see the Note for each quote that you have created for this opportunity. When you view the note, you can right click and choose 'Open' to launch QuoteWerks and open that quote. This feature is very useful for organizing and finding your quotes from within Microsoft Dynamics CRM. When saving a quote, QuoteWerks automatically creates or updates a Sales Opportunity under the Sales tab for the Contact in MS CRM. When you are in MS CRM and select the Sales tab for this contact you will see the sales opportunities and their sale amounts for each quote you have created for this MS CRM contact. The Sales Opportunity feature is very useful in determining your projected cash flow. By creating sales opportunities in MS CRM you can generate reports in MS CRM that give you insight into your sales pipeline. If you already have a sales opportunity for this quote, it will automatically update the existing one to reflect changes you have made to the quote. If you need to forecast your sales for each individual product you are selling in the quote, QuoteWerks has a built-in reporting module that can create such a report. We create quotes with the expectation that the quotes will become orders. When the customer accepts the quote, QuoteWerks will convert the quote to an order and also convert your existing MS CRM Sales Opportunity into a "Closed as Won" sale. 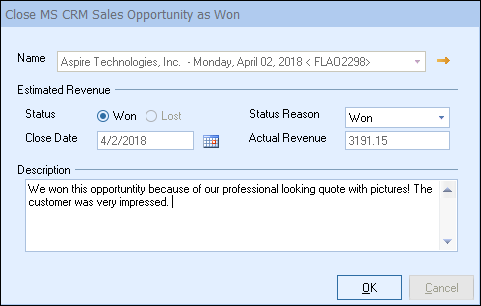 If no Sales Opportunity exists in MS CRM (This would be the case if a customer called to place an order without requesting a quote first), QuoteWerks will simply create a new "Closed as Won" Sales Opportunity in MS CRM. 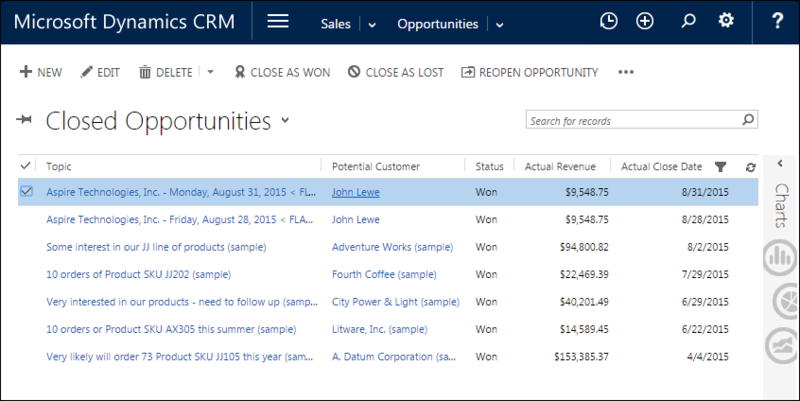 In MS CRM, you can run reports that tell you how much income was generated from the orders you have received. QuoteWerks also has a built-in reporting module that can create similar reports. When saving a quote, QuoteWerks offers to schedule a follow up call for you in MS CRM. By scheduling follow up calls, you increase your chances of closing the sale! 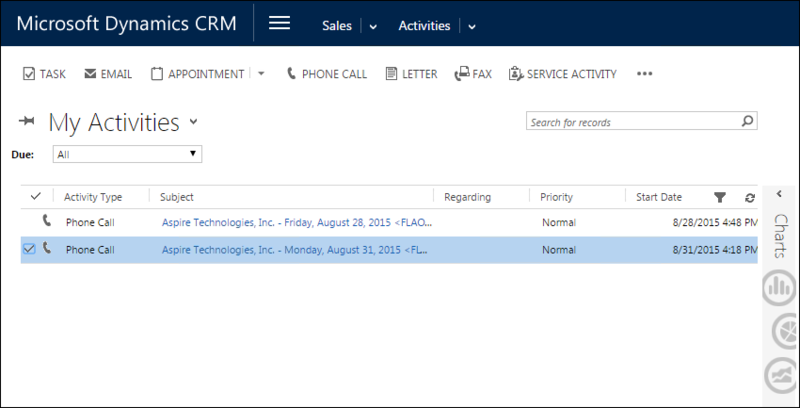 The follow up call will be listed under the Activities tab for the Contact in MS CRM. 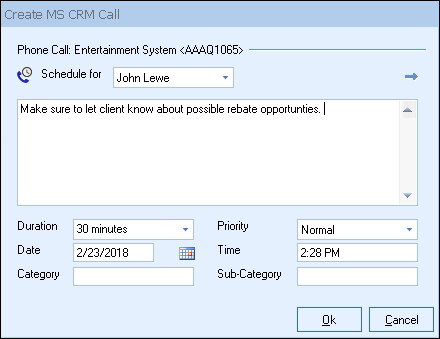 When you select the MS CRM contact to use in the quote, our innovative DataLink feature can automatically pull other information from MS CRM into the quote such as customer terms, customer sales tax rate, customer profile etc. Customer profiles can be used by QuoteWerks to determine the appropriate pricing a particular customer should receive. 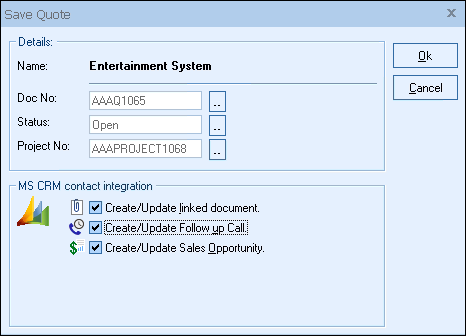 The MS CRM DataLink is bi-directional, so field information can be copied from QuoteWerks into the MS CRM opportunity and then fields can also be copied from the MS CRM Opportunity into QuoteWerks. QuoteWerks has a built-in print layout designer that allows you to customize the look of your quote. 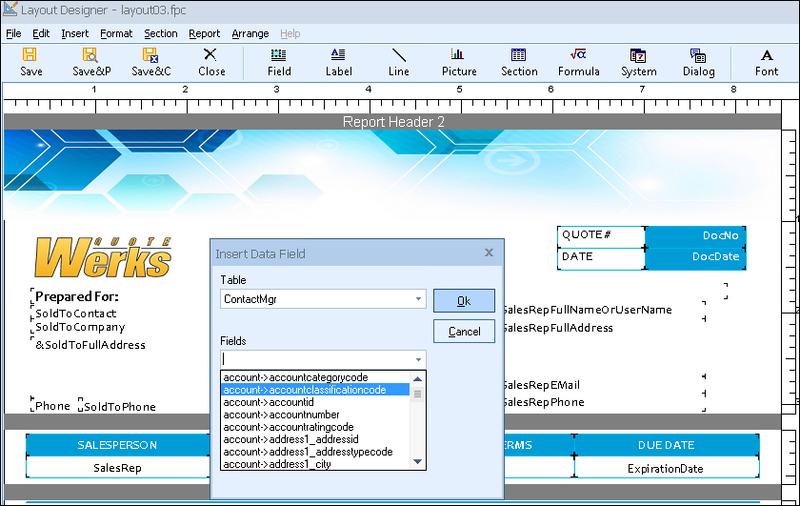 The print layout designer also allows you to easily insert data fields from MS CRM into the QuoteWerks print layout. 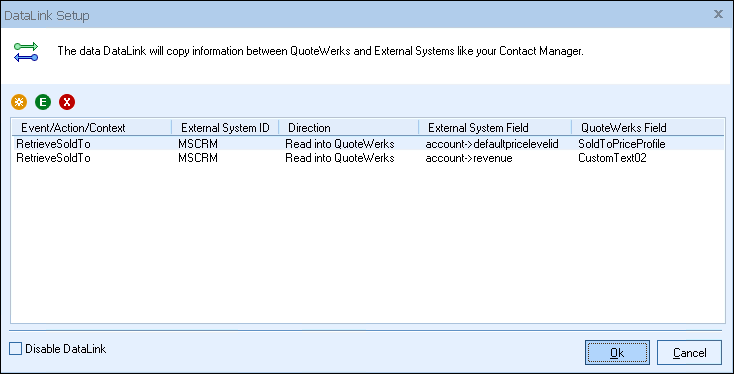 Then, when you print the quote, QuoteWerks will pull data from the MS CRM contact fields that you inserted into the print layout resulting in a printed quote that includes information from your MS CRM contact record. 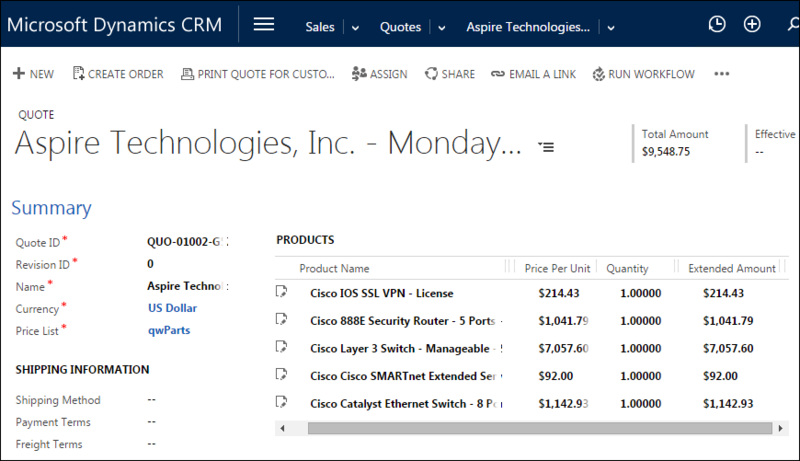 This feature is different from the DataLink feature (described above) in that this extra data is pulled from MS CRM and printed, but not saved with the quote. 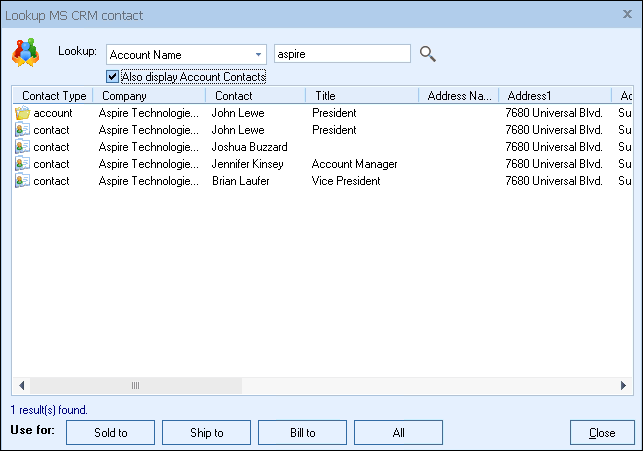 When you need to save the information pulled from MS CRM into the quote, you would use the DataLink feature. So, for example, if you are using a field in MS CRM to store the contact’s assistant’s name, you can insert that MS CRM field into the print layout so that when the quote is printed, the assistant’s name will be printed on the quote, but not saved with the quote. Many of the fields in QuoteWerks have a lookup list option. When you press the F2 key while in one of these fields, QuoteWerks will display a list of values that you can choose for the field. 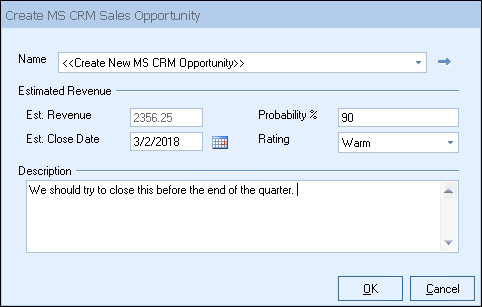 You can create a macro value that pulls information from a field in MS CRM. For example, if you press the F2 key while in the terms field in QuoteWerks, QuoteWerks will display a list of terms options that you have previously entered. You can create a new option that retrieves a value from a field in MS CRM that you use to store your terms.